This blog article is the second of the Ultimate Guide to Using LinkedIn to Find New Clients. 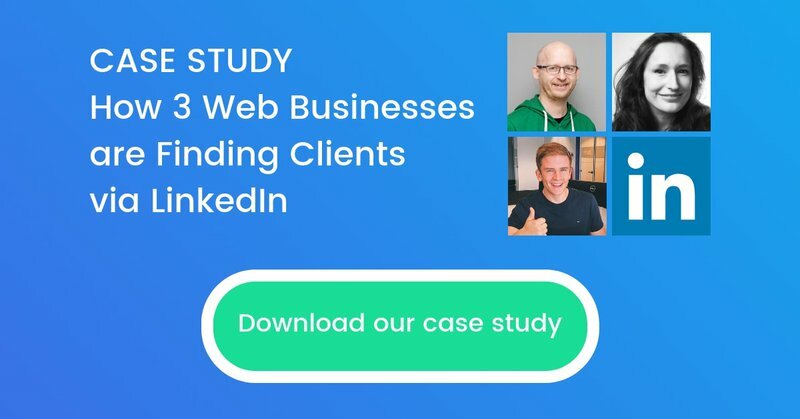 This 3000+ word guide will help you use LinkedIn to find new clients, connect with them, and generate leads to grow your web design business. To find the right connections use the search bar and advanced filters. Add the search term in the search field and use the advanced filter to segment people, e.g. Peers - Want to know what others are up to? Want to share learnings, successes & frustrations? Connect with your peers and competitors. TIP: You want to connect with people who are active on LinkedIn AND have many connections. How do you find them? Check that they have 500+ connections AND any activity mentioned in the Activity field. TIP 2: Try the Premium version for free for a month for extra search filters (just remember to cancel the subscription). LinkedIn usually offers the Premium to test for free every 6 months or so. I’ve so far never paid for LinkedIn yet as the free features are enough. I think it’s only recruiters and people in sales that benefit the most. Some people only connect with people they meet in person; some people accept all requests without thinking. I prefer something in the middle. WARNING: When you connect with someone you give them access to your network’s contact details - hence it’s not a good idea to blindly connect with everyone in case this will lead to spam or abuse. But LinkedIn is an online platform, enabling global access to all kinds of interesting people, so I wouldn’t limit it to only people I meet. This philosophy has led me to get customers as far away as the US and Australia! I generally accept requests from people either with a clear relevance (in my case: they are entrepreneurs or active with marketing or events). Sometimes I ask them how they found me and why they want to connect before accepting the request. When I connect with people I try to include a note stating why I want to connect. I always connect with people I meet because these are very strong and valuable connections. What to include in a note? Something like this can be sent out to multiple contacts, yet it feels very personal and friendly. Just swap the word ‘marketing’ to something relevant for you. After connecting I often ask my connections “what are you excited about this week?”. This is a great conversation opener. Often you get asked the same question back and here you can start to tell them about what you do - without being too salesy or cheesy. I’ve also tried the question “What is challenging at this moment?” but found people didn’t want to share this with a “stranger”. If you think sending requests to people you haven’t met is too much for you right now, you can start by following people you find interesting. The next step is to engage with posts - the more you use LinkedIn the more LinkedIn will know what you are interested in. This will make your LinkedIn wall go from boring to very interesting. It is what got me hooked and how I started to see the huge potential to use it as a marketing channel. How to engage with posts? Comment - say ‘thank you’ and show you have read the entire post/article. Ask a value-adding question such as “What do you think about x?” or “Can you elaborate on y?”... Whatever the answer is it will enable anyone reading to learn more, and you give the original author a good feeling to the original author + it shows you are active in the field. Don’t share posts on your wall. At the time of writing this article shared posts rarely get any views. LinkedIn now allows you to search for content. Just select ‘content’ under the search bar. Look for people posting actively about your fields of interests, and look at who is commenting on those posts. Engage with these posts if relevant. Also, if you search for “looking for x” (where x is your title) you will have a wall filled with posts of people looking for your service. If you answer these posts it might be hard to stand out from the crowd. One way of doing so is by asking someone else to recommend you and that they would also elaborate on why you come recommended. Imagine also that the poster gets many private messages and applications in as a result of the post - it looks far more impressive if someone else you’ve worked with sends a message recommending you. Right now the above tactic can be full of irrelevant info and spam. I suspect the content search feature will evolve over time to show only popular and location-based posts. This article is the first part of a series on using LinkedIn for lead generation. Read the third part on how you can use content to connect with your LinkedIn audience. Article written by Jenny Björklöf - Event Marketing & Social Media Specialist | Entrepreneurship & Freelance Advocate.